What comes to your mind when hearing about baby powder? It turns out that baby powder is safe for babies, and you could be use it for daily beauty care. Baby powder can be used for face mask. Especially in the hot weather, this mask can soothe and cool the face. How? 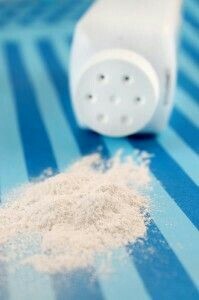 Combine 2 tablespoons of baby powder, mix it with a little water to form a paste and then spread throughout the face. Do you ever feel that your busy schedule and activity make you sweating so much then cause an unpleasant body odor. When at that time and you forgot to bring deodorant? Yes you could use a baby powder immediately. How? Just go to the bathroom when your body is no longer sweating, wash your armpits with water, dry, apply thin baby powder. That good yet relaxing smell will makes us fresher! Baby powder can give matte effect to the makeup. The trick is easy, powdered thinly with a thick brush. Bye bye oily face! Want a georgeus eyelash eyelash? Easy! Add baby powder interrupted with mascara. So let that step, mascara-dry-powder-mascara-dry. Eyelashes will look thick and georgeus! Thin eyebrows? Ah not again if you decide to use baby powder. Add a little baby powder on the brush of the eyebrows to give the impression of thick eyebrows. Primer is usually applied before using eye shadow. Instead of buying, just try to use baby powder. Apply the baby powder on the eyelid as a primer, amd just continue wearing eyeshadow. What for? So that the color durable and prevent oil damage the appearance of eyeshadow. Colorstay lipstick is a bit expensive. But you can be use ordinary lipstick then turn it to be a colorstay lipstick. The trick is... use your lipstick as usual, stick the tissue on the lips until the lipstick tasted, then slowly touch it with thin baby powder on your lips. Do you ever experiencing be part of the wedding and that requires your hair use much hairspray for hair do and something like that? We must didn't like the end when party comes to an end then we should trying so hard to make our hair back to normal. Try with the baby powder, it will be more quickly unraveled. Do you have any baby powder for beauty care more?